We first met Robin & Michelle on the boat Warrior in Zihuatanejo when we were so busy with Sailfest in January of 2007. After we crossed the Tehuantepec in February of 2008 and anchored off the coast of El Salvador, Warrior pulled in and dropped a hook behind us a few hours later. Since that time we’ve enjoyed Robin & Michelle’s company off and on as we’ve traveled south, back north again, and further south yet. They were in the US finishing up work on a research grant when they decided to buy a boat, learn to sail, and take her home to Australia. They found Warrior for sale in California. She had been designed by Brit Chance, a designer of America’s Cup boats and the son of a colleague Robin had worked with early in his career. Warrior is a cold molded wooden boat, 50′ long and built for speed. She was famous in the racing circuit in the US for years, winning Trans Pacs and many other long distance ocean races. When Warrior left Panama last January they were bound for the Galapagos, Easter Island, Pitcairn, the Gambiers and then back up to the Marquesas. It was a several thousand mile detour south that Robin was determined to make and we wish we had the time to do as well. But Warrior was built to sail to weather and they enjoyed the trip immensely. 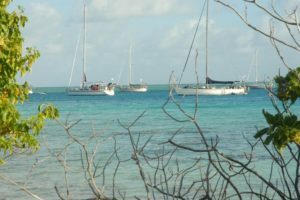 We didn’t catch up with them again, though, until our stop in Anse Amyot in the Tuamotus. Robin had started feeling a little off in Panama, and by the time we saw them in the Tuamotus he was feeling pretty bad and had lost a lot of weight. We saw him at dinner twice in Anse and he did a little snorkeling, but they were just waiting for the weather to settle so they could get to Papeete to a doctor. Even with Michelle’s doctorate in language, and French as one of her languages, it became apparent that he needed care at home in his native tongue, so he flew back to Brisbane soon after arriving at Tahiti. The diagnosis is cancer and he’s home to stay for treatments. In the meantime, Michelle has rounded up crew and is sailing Warrior the remaining 3,700 miles back to Brisbane. That’s a daunting task for any of us to have to take sole responsibility for our little boat without our mate. Michelle wants Warrior home though, to give Robin a special place to hang out while he endures chemo. Warrior and Michelle will take good care of each other on the long voyage home.